Yesterday, I went to a neighborhood yard sale and found some vintage Brownie box cameras. The one on the left is a Brownie Junior Six-20, manufactured from 1933-1936. The one on the right is a Brownie Target Six-16, manufactured from 1946-1951. 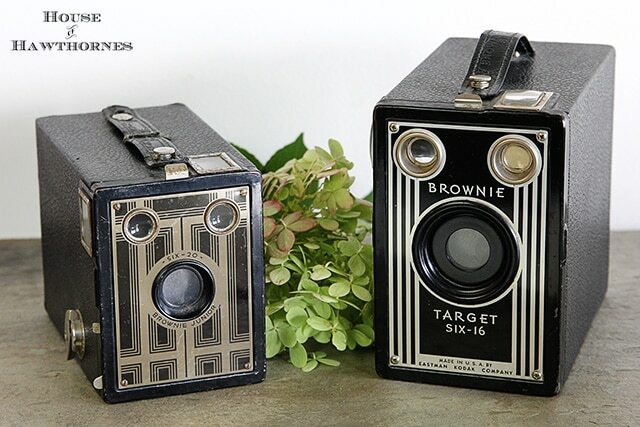 In my Useful Links page (found underneath my header photo above) there is The Brownie Camera Page listed, which is a great resource for dating old Brownies. It also has some information on other Kodak cameras. Yes, Kodak made other cameras besides my beloved Brownies. 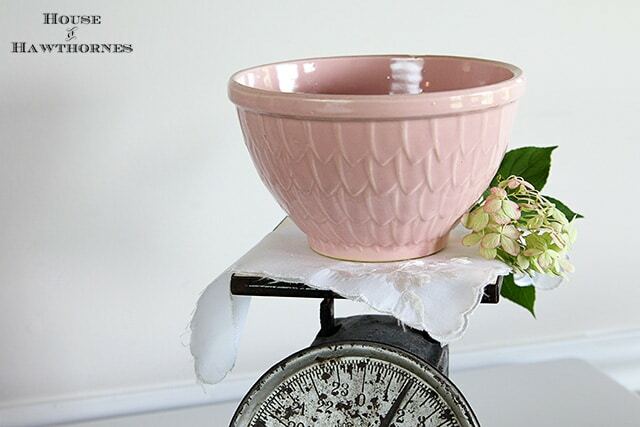 Speaking of Brownies, wouldn’t this cute little pink McCoy mixing bowl stir up some great brownies? I found it Thursday, at a little antique store. I’m confused as to what the pattern is called though. I’ve seen it called fish scale, petal, feather and even artichoke. I just call it cute. It has a hairline crack in the side, so I won’t actually be stirring up anything in it. It’s more decorative than useful, but for $2, I just grabbed it and didn’t look back. Well, I paid for it, of course. Those brownie style cameras are on my wish list for estate sale land. Love that pink bowl. $2 is a great steal. Those brownies look in remarkably good shape. Good find. Great bargains, love the Brownie on the rt. Glad to know someone else appreciates things not in perfect shape…I like the pink bowl, it looks great! I was scrolling through emails and your heading, Vintage Brownie, caught my eye. Old baked goods? Being a chocoholic, my curiosity was peeked…silly me, you were writing about cameras. No wonder I will probably never, ever get to my ideal weight. Oh well, a sense of humor trumps skinny in my book. Thanks for all the smiles you bring. Love the bowl, I just call it pretty. Fish scales gets my vote. Great finds! Love the Brownies and the sweet bowl. My sister collects old cameras after finding our grandfathers in a box of stuff destined for Goodwill. Can you believe what some people will get rid of? I am always on the lookout for more for her display but have never found any for $5. You seriously scored! That pink bowl is sweet too! Wonderful finds, Pam…and your photos are so pretty, too! And congratulations to Pamela! Great finds! I love that sweet bowl. The pattern is great no matter what is called! Nice scale too. I passed up a cute scale a few weeks ago, and I’ve been kicking myself ever since. LOVE the cameras and that pink bowl. I love all vintage cameras. I think they are such a cool accessory for home decor. Your pink bowl was such a great find as well! P, you found some cutie cameras, that’s for sure! Great to add to your collection, super price, too! You always hit the best sales, girl. My first thought upon reading your title…Vintage Brownies don’t sound very tasty. Then I clicked on your link and whew…they are cameras. Very cool looking ones too. Oh that Pink Bowl is awesome! I’d love whipping up brownies in that. You “stole” that little bowl. What an awesome find. I would have done the same!!! I love it when I come across stuff like that. Those Brownies are just adorable and what a price! I am not much into chocolate (I know people think something is wrong with me) so those cameras are my kind of Brownie! Like SuzieQ, up there, I saw the word “brownies” and had to go there..lol..Love the Brownie cameras. I remember my grandma using one too. They look in excellent condition..what a find. Also, love the little pink bowl, I vote for artichoke design. Have a great day and thanks for sharing your treasures with us. LOVE your little pink bowl!! Such a sweet vignette with the scale and scattered hydrangea. 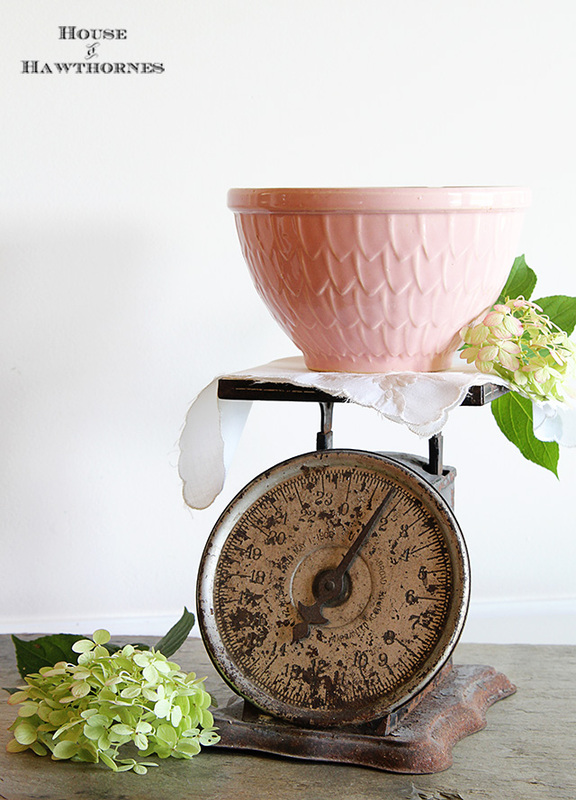 Luv that pretty pink bowl…$2? What a deal!! Great finds! I love the camera’s and the bowl is so pretty. Your photos are gorgeous by the way. Limelight hydrangea’s perhaps?? Bargain city!!! They’re great and what a bargain!